Wow, what a list. These people eat well with a variety of ingredients to make meals from around the world. They have a cat and children. The illustrations are great, I particularly like the little bird perched next to the cat biscuits. Lots of help from the children to make this shopping list. Fruit, bread | rolls | bagels, Dolmio sauce x 2, Lasagne sauce and sheets, Appals x 100,000, chicken pieces, chicken breast and thigh, mince x 3, sausages x 2, bananas x 54, cod pieces, kids bits, cat biscuits, scampy fries x 2, cheese, homs?/meats, coconut milk, grated cheese, mozzarella, halloumi, sour cream, taco shells, mange tout, baby something, cucumber, chillis, tomatoes, salad, avocados, olives, coriander, onions, mushrooms, peppers and “by a chinees takeaway for cata” [sic]. On the reverse is soy sauce, garlic, ginger and comfort. I think “hams/meats” and “baby corn”. Many of the ingredients in the bottom right list are stir-fry staples (not salad, tomatoes, avocados or olives). She (because I think it is a she) is catering for a large number of kids (perhaps a day-time summer club or scouts event) 54 bananas! She is making toffee apples and sprinkling them with 100s of thousands (sprinkles). She is making a large lasagne (fish for non-meat eaters). 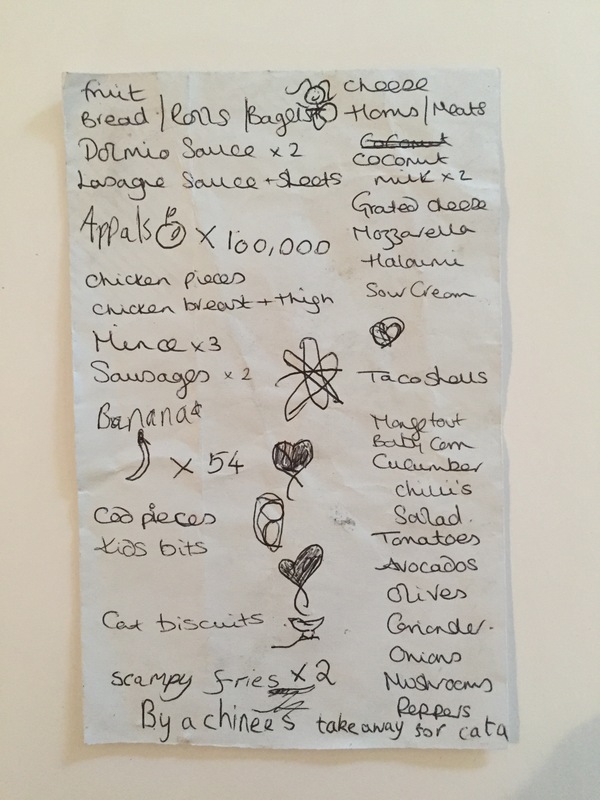 On the right is her personal family shopping list (or for the adults) with a take-away for her daughter as she will be too busy cooking all this other stuff.